Why Do I Need To Know This, And How Do I Figure It Out? In order to figure out the proper doses of many chemicals for your pool, you often need to determine approximately how many gallons of water it holds. Also when adding a Pool Heater, Heat Pump or Solar Heater to your pool, you will also need to know how many gallons you are dealing with. To do that, you need to use a ruler to measure your pool to find out these four different numbers; Length, Width, Diameter (for Round Pools), Average Depth and then use a Fixed Volume Multiplier to determine the approximate number of gallons the pool holds. If you have never done this before, don't worry. 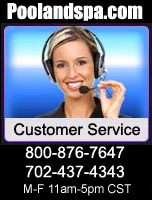 We will walk you through the detailed steps below. I Know What I'm Doing. Just Tell Me The Formulas. If you don't need a detailed tutorial, and you already know your measurements, and how to calculate average depth, here are the quick formulas for you to use on your own calculator. Well, I Have The Basic Measurements, So Can You Just Figure It Out For Me? Absolutely. You can use the E-Z Pool Water Calculator below to get the approximate number of gallons in your pool. 1- Length And Width are for rectangle, squares or ovals. It is best to use whole numbers, rounded up. For example, if the pool is 16 1/2 feet wide, use 17 feet as the width. 2- Put the Diameter in the Length And Width fields for Circular pools. It is best to use whole numbers, rounded up. 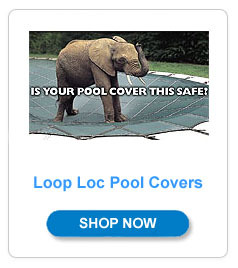 For example, if the pool is 21 1/2 feet in diameter, use 22 feet as the diameter. 3- For the Average Depth, it is best to use whole numbers, rounded up. For example, if the Average Depth is 5 1/2 feet, use 6 feet as the Average Depth. 3- Use the Gallon Multiplier of 8 for rectangles or squares for best results. 4- Use the Gallon Multiplier of 6 for Circular or Ovals for best results. Give It A Try For Yourself ! I Know Nothing. Please Walk Me Through The Whole Process. If you know nothing, don't worry! Most people have never done this before. So we will show you the easiest and best way to measure your Pool. Remember, No One Expects You To Be 100% Exact. Just Do The Best You Can. Please realize that you are never going to be 100% accurate due to calculated pool water gallons (volume) are an approximate value due to the variations in the sizes, distances and angles of the various pool shapes and slopes. 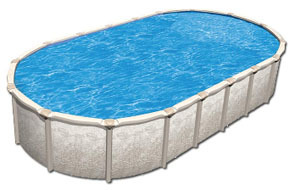 Also a pool can be filled "to the top" and can also only be filled only "X" amount of inches from the top. For example, a huge rain storm can raise the water level in a pool by a few inches over night, as many people have seen all too often. And a few inches (up or down) will change the "exact" number of gallons in any pool potentially hundreds or thousands of gallons, depending on the overall size of the pool. So don't worry. And don't get too hung up on being overly exact, just do the best you can with your measurements. What Do I Need To Measure, And How? 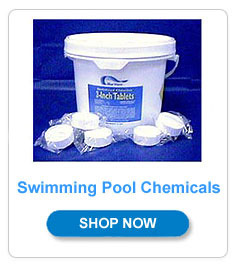 You can easily measure the Length, Width and Diameter (if Round) of any swimming pool with a typical ruler. Write down those measurement, generally to the nearest foot will be good enough. If you are lucky enough to have an Above Ground Pool, or some Inground Pools where the entire bottom is one Depth, it is very easy to figure out the Average Depth. It is just the Depth of the water. Measure it and write down that number. 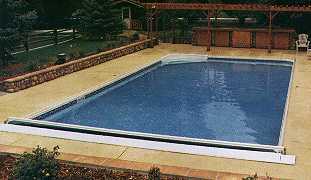 However, most Inground Pools, and many newer Above Ground Pools have varying Depths, usually with angled Slopes going from level to level. This makes getting an Average Depth a bit more difficult. 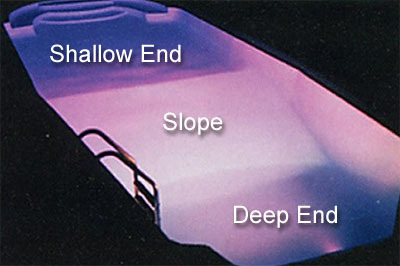 Below is a side-shot of the "typical" inground pool that has a shallow end (see "D"), then a slope that leads into the deep end (deep end is "C"). If you have a long firm ruler, use that to take your measurements for the Depths. If you have a ruler, but it isn't very firm, or long enough, just use your vacuum pole to mark the depths of the pool with a simple piece of tape (or magic marker) on the pole. 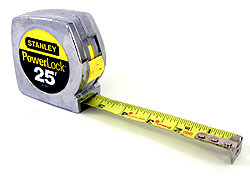 Then just take your measurements off the vacuum poll with your ruler. Again, you just really need the gist, don't get too hung up on an inch or two either way. Usually measurements like 3', 4', 6, 8', etc. are good enough. First measure the depth of "D", the shallow end (usually anywhere from 3' to 5'), and then measure the depth of "C", the deep end (usually anywhere between 6' and 12'). Then, add them together and divide by 2. This is the Average Depth of your pool. Therefore, in this example, your Average Depth would be 6 feet. 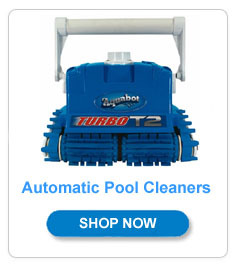 So Now, Scroll Back Up On This Page To The E-Z Pool Water Calculator And Give It A Try! 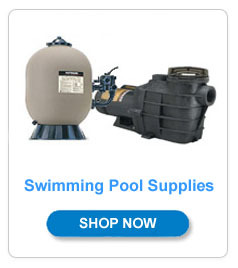 Just take your newly discovered measurements for Length, Width, (Diameter if Round), and Average Depth - and plug those numbers into the E-Z Pool Water Calculator and see how much water is in your pool. It's that easy! Blah, Blah, Blah. I Really Don't Have Time For All Of This. Can You Just Cut To The Chase? 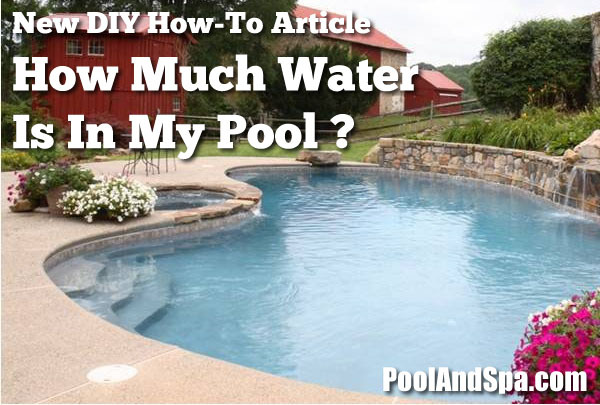 If you just don't care that much about knowing the "exact" amount of water in your pool, you are in luck! We have created some handy charts of the most popular sized Pools, and their Average Gallons of water. These charts are generally accurate enough for most residential uses. Can't find what you need? Feel free to give us a call.